Jay Bookman: "What is the point of saying that there was a spy in the (Trump) campaign when there was none?” asks U.S. Rep. Tom Rooney, Republican of Florida and a member of the House Intelligence Committee. “You know what I’m saying? It’s like, ‘Lets create this thing to tweet about knowing that it’s not true.’ … Maybe it’s just to create more chaos but it doesn’t really help the case." Tom Rooney is not running for re-election. U.S. Rep. Trey Gowdy, chairman of the House Oversight Committee, received the same classified briefing about the FBI investigation as Rooney, and reached the same conclusion. "I am even more convinced that the FBI did exactly what my fellow citizens would want them to do when they got the information they got” about Russian interference in the campaign, Gowdy said. Trey Gowdy is not running for re-election. Paul Ryan is not running for re-election. These top Republicans know that Trump is not just lying to the American people, but lying to them on a grand scale, and about something important. They know that the president of the United States is falsely attacking the credibility and integrity of the FBI and the Department of Justice in a desperate attempt to save his own skin, and they are finally saying so, if more delicately. Other Republicans know all that too, but unlike Gowdy, Rooney and Ryan, they don’t dare to say so. With rare and courageous exceptions, the only Republicans who dare to question the emperor's oh-so-fine, resplendent new clothing are those who are leaving the game in disgust at what it has become, and at the price they pay in self-respect to remain. Everybody else has made a different calculation. Some are true believers, having fully convinced themselves that the president is the victim of a Deep State conspiracy against his election and against the Constitution itself. Others have concluded that the damage they would do to their own standing in the party by speaking out is more important than the damage being done to the country by their silent acquiescence. And certainly, the political damage would be significant. “Shame on Trey Gowdy,” an angry Sean Hannity said afterward, attacking a man once considered a right-wing hero. Conservative Republicans in the House have also begun demanding Ryan’s premature ouster as speaker, as the price he must pay for disloyalty. The one issue on which some Republicans have managed to find a voice is free trade. Trump has managed to unite most of the world against us on trade, with our closest allies the angriest, and the prospect for major economic damage is growing. 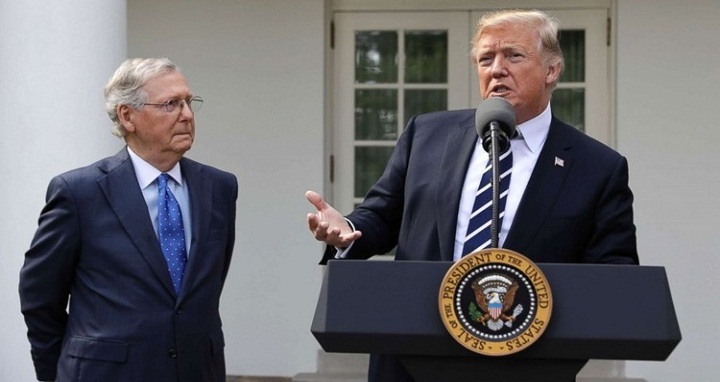 Even Senate Majority Leader Mitch McConnell says that "I don't think anything good will come out of a trade war," noting that his home state of Kentucky has a lot to lose in bourbon exports. "I hope we pull back from the brink here, because these tariffs will not be good for the economy." And when legislators are too afraid to legislate, well, so much for checks and balances.